In 2019, we welcome Sarah Kirby as the Directress of 1B Sea Stars Class. It is with great sadness that we say good bye to Debbie, our long term member of CMS. We wish her well on her next adventure in to natural health and travel. We also look forward to seeing her as a relief teacher. Thank you Debbie for the lovely gifts of bush tucker trees and books! The Sea Stars have been working with the primary colours of Red, Blue and Yellow. Students have used the primary colours in their artworks and have explored with mixing the primary coloured paints. We have been so lucky to have some students brought in their own creations for show and share!! Yesterday we were scientists investigating and exploring how food colour travels through paper towel and when two primary colours are mixed together they create secondary colours. Thank you to everyone who brought us their scrap paper for the Sea Stars to make recycled paper this week. The students made recycled paper for our Clean Up Australia Day activity. They added petals, herbs, coloured paper and essential oils. A huge thank you to Kate for coming in and helping us, the paper looks amazing, we can’t wait for it to dry!! On the 6th of March 2017 the Sea Stars participated in Clear-Up Australia Day. We learnt the importance of the day and talked about what we can do as individuals to help keep our environment beautiful. Our class ‘rep’ this year is Shanan Brandis. Shanan will be forwarding any important messages or classroom newsletters that need to be sent to the parents of this class. I will let Shanan inform you on the best form on contact if you wish to talk to her. The children are to carry and place their own bags to and from school. They are to place their school bags on the hooks provided. Preps to place bags on top hooks. When entering in the morning students are to have with them their hats, water bottles, lunchboxes and sock and shoes. The children have a short ‘munch and crunch’ break before lunch and this time is determined by themselves. The items in which will be strong advised for them to bring for this time is fruit and or some vegetables,with a side order of yoghurt if need be. Please be mindful of what you are providing for your children to eat each day. Have a quick read over the schools food policy and if there is anything in there you need clarifying please see the office. Monday Smoothies: The cost of the Smoothies are $1 and the flavors will vary from week to week. Prep age students are to keep their money in bag until lunch play to purchase their smoothie. Kindy aged students will hand money over during morning welcoming. Friday Icy Poles: The cost of the Icy poles are $1 and the flavours will vary from week to week due to supply. Prep age students are to keep their money in bags until lunch play to purchase their icy poles. Kindy aged students will hand money over during morning welcoming. Please, please, please have shoes for your child that they can do up independently. Have everything labeled and this includes shoes. It doesn’t have to be always marked with their name but a distinctive feature such as a coloured strip on the inside of hat or the inside liner of shoes will help children quickly and correctly allocate their belongings. Message book: to the left of the sign-in sheet will be the message book in which you are to place any information you need myself or Rana to know about your child regarding that day. A small clip is attached to the top of the book to show a message is in. Messages that require more detailed discussion will have to be placed in a written email to and we can set an afternoon that best fits. The doors will be open to the children from 8:15am. This is a great time for them to get organized for the day. At 8:30am they will be starting their morning with ‘circle time’ and the door will be closed to signify the beginning of the working cycle. If you happen to arrive late you will need to get a late slip from the office. Please remember to sign in and sign out your kindy age child each and every day. The prep aged students are not required to sign-in or out. Preps will be taken to the pick-up area for collection at around 3:45pm. The kindy aged students will be collected from the classroom. Parents could you please wait outside both morning and afternoon as the classroom is the child’s responsibility and have their own jobs are to be complete each day. Thank you for your support in fostering their independence. Both Italian and P.E. will be on Friday from 9:30pm till 11:15pm. So sports uniforms are required. Library is every even school week each Friday…I suggest to bring it every Friday as to not forget. Home readers will start for students in the coming weeks for students that are identified as ready readers. If I get enough interests from parents I will provide my time one afternoon to give a run down on how best to deliver home readers to their children. If you are interested on a reading at home session then email me by the 17th of Feb so I can organize a date. A small amount of laundry will be required to be washed by a parent each week. If you think you can help out then place your name on the sheet provided to which week you can do it. Much appreciated! Flowers are need for classroom activities. If you think you can help out in providing the class with some flowers for the week then please fill in your name on the roster near the sign out sheet. THANK YOU!!! On our around your child’s Birthday the Sea Stars will celebrate as a group in a walking around the sun candle ceremony. We ask if you wouldn’t mind sending a small plate of fruit to share as well as photos of your child from each year since birth. Please email me if you would like this to happen for your child a day or two before the event. On the 15th of September the cycle one classrooms welcomed Louise from the Moreton Bay Shire Council in to talk to the students about koala conservation. Prior to her arrival, the students have been learning about the basic needs of living things and the importance of natural habitats. Louise informed the students that they are going to be part of a collective survey on living things in their schools environment with special interest in koala’s in the area. The students were made aware on what to look for when trying to discover whether or not they had koalas living up their trees. Did you know that the first place you check is the base of a tree for koala skat (droppings)? No? Neither did I. Louise was kind enough to bring in a sample of koala poo for all of us to smell. It smelt just like gum leaves! She also informed us all to look for two to three claw makes up the trunks of trees for signs that koalas have been there. A group of students walked around the grounds with Louise as they kept a keen eye out for any signs of living creatures within our school environment. 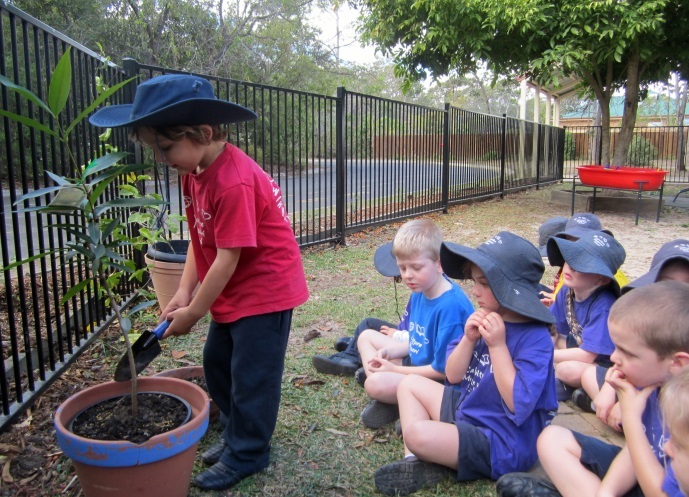 They reported back that there were sightings of different species of birds, and insects and as well as evidence of possums and snakes living with in our community. It was particular interesting to hear they there may have been evidence of koalas living up our trees. This term the children will be exploring the continent of South America. We will be looking at the different animals that habitat the continent and students will select one animal to talk about to their peers. We will also be cooking foods from regions in South America. The Sea Stars will also be discovering the different types of landforms found on Earth. The children are to carry and place their own bags away into the port rack. The children have a short ‘munch and crunch’ break before lunch and this time is determined by themselves. The items in which will be strong advised for them to bring for this time is fruit and or some vegetables,with a side order of yoghurt if need be. Message book: to the left of the sign-in sheet will be the message book in which you are to place any information you need myself or Jane to know about your child regarding that day. Messages that require more detailed discussion will have to be placed in a written email and we can set an afternoon that best fits. Meeting times can be booked through email. Tuesday and Thursday afternoons are best for meetings. The doors will be open to the children from 8:15am. This is a great time for them to get organized for the day. At 8:30am they will be starting their morning with ‘circle time’ so please ensure they here on time. Andy Tribbeck is the classroom’s representative. Andy will be forwarding any important messages or classroom newsletters that need to be sent to the parents of this class. Welcome to Michael Brandis with parents Cameron and Shanan. Also welcoming Hunter Botha with parents Charmaine and Wayne. Both Italian and P.E. will be on Friday afternoons from 1pm till 2:45pm. So sports uniforms are required. August 1st Cross-Country at 2pm, parents are welcome. The Sea Stars are involved in taking care of the garden on Tuesday afternoons. If you would like to help out those afternoons then please let me know. I would love it if we have a parent with some expertise on worm farms and compost bins to come in and have a chat with me as we are keen to start them up. Show and tell will be starting up next week with a chart going up on the class notice board informing on which child is on a particular day. The theme for the items is to be based on animals in their/our environment. Egg shells are needed for practical life activities. If you have any food scraps could you please bring them in of a morning as our chickens will appreciate them. The birthday celebrations take place in the afternoons starting at 2:15pm. The children are asked what they were able to do at each stage of development. Photos of each year from birth are also shown. An offering of a health snack is also welcomed. If you are available you can watch this event take place. Sports Day 22nd of August. We need 7 parent helpers on the day. Three running activities and three working with groups and one on Board Patrol. If you would like to volunteer place your name on the list outside to classroom or email. Monday the 4th of August at 3:15pm will be a session for parents on how to read with their children.